Wildcats Stats: Birbarer 1+0, Hoog 1+0, Johnson 1+0, Bullas 0+1, C Jones 0+1, S Jones 0+1, Liddiard 0+1, F Taylor 0+1. Bison Stats: Sampford 2+0, Norcliffe 1+1, Cowley 1+0, Bordowski 0+2, Klejna 0+2, Dewey 0+1, Tait 0+1. With all the bad snow affected areas around the South on Friday, all Bison fans must have been wondering, whether the Saturday evenings game would go ahead or not. Then Friday evening, the Swindon Wildcats put out the tweet, that put every fans mind to rest, the game was ON - Woo Hoo!! The early minutes of the game were as expected, fast & furious. George Norcliffe bringing a good save from Renny Marr. A few minutes later and Swindon managed a 2-on-1, when Bullas & Birbraer bear down on the Bison net, but Tommy Ralph broke up the play, with a great interception. Swindon took the first penalty of the game, when Neil Liddiard was called for Tripping at 11.42. Although Bison had the extra man, it would be Wildcats that almost opened the scoring, when Chris Jones got away and tried to slot the puck on Mettam�s 5-hole, but Alex denied him. Wildcats returned to full strength and lay siege again on the Bison net. A couple of goalmouth scrambles ensued and with Mettam out of position and prone on the ice, Swindon looked like they'd score, but for an amazing goal line save by Liam Morris, or so I thought (I received a message from Michal Klejna, saying it was him that made the save, not Liam! lol) So, I apologise to Klej, it was an amazing goal line save by Michal Klejna, although I'm sure Liam assisted him!! Then, Klejna was definitely involved, when his pass set free Norcliffe on the right wing, George skated in a let a lovely shot go, which beat Marr. Goal timed at 16.02. Just after the restart, Liam Morris was given a High-Sticks penalty, but Matthews clearly missed the Cross-Check by Bullas on Morris. No shock there! Bison almost doubled their lead when Klejna skated in short-handed and let a ripper slapshot go, but Marr saved well. Wildcats Chris Jones, was called at 18.00 for Tripping. But as the period ended, the penalty was killed. At the end of the 1st Period, Bison lead 1-0, going into the 2nd. The 2nd Period started with Swindon on the push to find the tying goal. Alex Mettam pulled off an amazing save (one of many, I will add!) to keep Bison still ahead. Then Swindon got another penalty, Sam Jones was given a Hooking call at 21.54. Wildcats killed the penalty though. Bison started to create opportunities, firstly Alex Sampford had a chance when he rifled a shot in, but the puck pinged off Marrs shoulder and to safety and then Liam Morris got in behind Swindon's defence, managed to get a shot off but Marr dislodged the net, so play was blown down. A few minutes later and it was now Swindon piling on loads of pressure on the Bison net. They had us penned in our zone for quite a while, but Alex & the Bison defence were standing solid. Mettsy did however, pull off a brilliant point blank save from Birbraer, which had the Swindon player already celebrating, thinking that he'd scored, but no, he was denied. However, the constant pressure did finally pay off for Swindon, when Luc Johnson wheeled away down the wing and let a shot go, that beat Mettam. Goal timed at 31.20, with assists going to Sam Jones & Floyd Taylor. 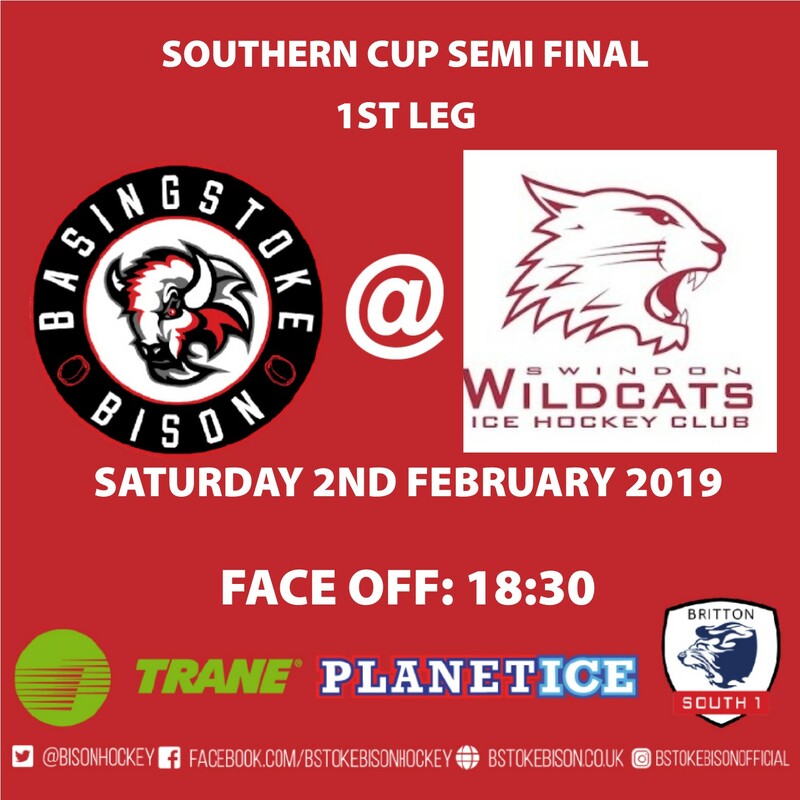 But don't fear Bison fans, from the restart a play in the Wildcats zone ended with Alex Sampford picking up the puck and he lasered a back hand shot into the roof of the net. I'll be honest, I didn't see it, as I was still typing the Wildcats goal details. LOL (That's the only problem with keeping everyone not at game updated, you miss the occasional goal here & there!) Having seen video footage of the goal though, what a shot it was by Sampford. How he got so much power on that backhand shot is beyond me. Goal timed at 31.42, assisted by Norcliffe & Richard Bordowski. At 32.24, Jay King was given a Tripping call, but Bison killed it off successfully. Then a few seconds on and Sampford was set up by Ralph & Bordowski. He skated in, picked his spot and roofed an amazing shot over Marr's left shoulder. Goal timed at 34.39. It almost got even better a few minutes later, when Bordowski raced onto a loose puck, got his shot off first time, but it agonizingly went just wide of the post. The final few seconds ran down on the clock and at the end of the 2nd period, the scoreline read.... Wildcats 1 Bison 3. Only one more period until we reach the halfway point in this semi-final. It didn't start as planned for Swindon, when Bullas was given a Roughing call, after he'd crunched Tait against the boards & then decided to throw a punch too. Ash just smiled as he skated away! Unfortunately for the Bison though, Swindon would get a massive bit of fortune to get back in the game. At 42.46, Liddiard set up Jonas Hoog, who got away a shot, it looked like Alex had it covered, but it took a deflection off Ash's stick, which in turn, wrong-footed Mettam in the net. As hard as he tried to reshuffle his feet, he just couldn't and the puck just crept over the line. A huge slice of fortune for Wildcats. But again, Bison fans don't worry. Just 18 seconds later, Bison restored their 2-goal advantage. Tait & Klejna combining to set up Cowley, whose shot Marr appeared to have saved, but then panic set in, as he looked behind him and he scrambled to keep the puck out of the net but failed! Goal timed at 43.04. Mettam was having one of those nights netminders love to have. He was making numerous saves, whilst using pretty much every inch of his goal crease. Some of the saves he was making were real highlight-reel saves and probably, didn't have the right to save, but we were all so pleased that he did. Into the last 10 minutes of the first leg. Wildcats took another penalty, when Liddiard was given a Hooking call at 51.11. Swindon did return to full strength however. Then Swindon scored which could be a very important goal. Bullas & Chris Jones setting up Birbraer. Mettam made an amazing first save, but the puck had enough on it to hook over Mettam into the net. Alex stayed down after the goal and it brought a lot of concern over the Bison fans & the Bison bench at the same time. Thankfully, after a few minutes and a little attention from Bison Medic Glenn, Alex was back on his feet and ready to go again - Phew!! Bison then hit penalty trouble, when Klejna was given a Holding call & then Coach Tait picked up a 10 Min Misconduct, for a slight moment of frustration, when he shot the puck against the boards. Really ........ Mr Matthews!! Penalties timed at 53.56. Bison managed to see off the penalty and returned to full strength. The final few minutes were ticking down...... 4, then 3, then the final 2 minutes of the game were announced. Bison still hanging on to the slender lead. We got down to 39secs left & Wildcats decided to use their Time Out. There was no way they'd need to pull Marr for the extra attacker, so the game continued. The final few seconds ran down, to the joy of the Bench and travelling Bison fans. It's only half the job done, but if you'd have offered me that scoreline before the game, I'd have had your hand off. Another great road victory for the guys. This could be very encouraging, as we go back to Swindon in a couple of weeks for a league game.